Mind Clouds – Brainstorming in Your Journal! Where do new ideas come from? They come from thinking in news ways and getting out of habitual patterns of thought. There are many ways that a journal can be used to help foster new thinking patterns that can change your life. One of those ways is to trap the abundant ideas that can result from a brainstorming session. Brainstorming is simply the rush of ideas that can result from reading inspiring books, learning new concepts or sharing thoughts with friends. The key is to trap the resulting flow of ideas and not judge them during their moment of creation. Non judgement will foster a quantity of ideas which ultimately results in the quality of ideas. Often it is the latter version of ideas that are the best as they morph from something seemingly silly into something solid. I like to use what has been referred to as a Mind Cloud when I trap a stream of ideas. I woke up one morning with the Trapping Idea concept in my head and immediately created the mind cloud you see pictured above. It was the concepts that resulted in this blog and will ultimately be spelled out in a book. A mind cloud starts with the central hub of an idea; in this case it is the title or concept of the book. Branching off from the central hub are lines that connect to nodes that make up the subtopics or possibly the chapter titles. Surrounding those nodes are the elements that support the sub topic and would be used to flesh out or build on the ideas they represent. This is a free-flowing, graphic representation of the old, rigid outline system most of us used in school. 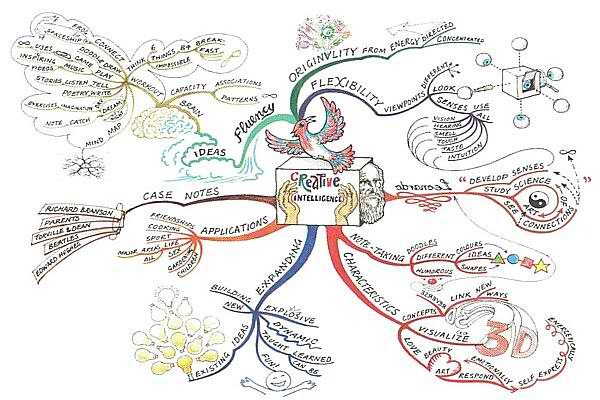 The beauty of the mind cloud is the ease of adding all kinds of ideas at a very fast rate in a very visual format. You can look at the resulting Mind Cloud at any subsequent time and see a snapshot of your thinking at the time it was created. It is also a great way to clear your mind of the thoughts that swirl around in your mental cloud and clear the way for new thoughts. I have included a great sample of one below that was created by Alan & Emily Burton. It has been said that we only use a small portion of the mental power that is available to us. Increasing your creativity with regular brainstorming sessions and then trapping the resulting Mind Cloud in your journal is a powerful discipline that will sow seeds of greatness.